Hi Everyone & Happy Thursday! Wow, the week is flying by, ha? I can't believe the weekend is almost here again~So, what kind of plans does everyone have? I have a few things on my "to do" list and then hopefully, get in a little crafty time! I managed to squeeze in a little crafty time the last few evenings...yes!! I am so missing everyone one in blog land and especially, my craft room. It felt good to get back in there! The base layer is SU paper followed with a layer of burlap pattern paper from my stash. I cut a fun polka dot pattern panel and then a panel of red which was embossed with the swiss dots folder. The sweet little coffee mug is Jaded Blossoms Coffee Dies and the adorable face is stamped with the Coffee Candies stamp set. 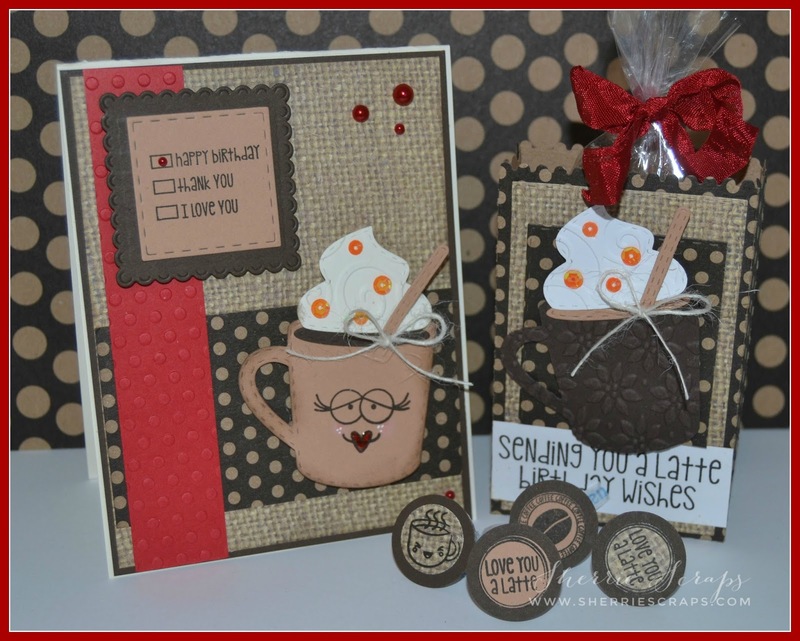 The whipped topping is embossed with the divine swirls folder and sequins from my stash.The sentiment is stamped with the Coffee Break Stamp set onto Stitched Square die and layered onto a Scallop Square die. The treat box is created with the Jaded Blossom Goody Bag Die using coordinating papers. The next layers are The mug is embossed with a Sizzix Flower folder and the whipped topping with the Divine Swirls folder. The sentiment is stamped with the Coffee Break stamp set. The kisses are created with the Coffee Candies stamp set as well. These are adorable !!! Love this set ! Wishing you a wonderful and blessed day ! Way too sweet! Love this little gift set! I am now craving a Starbucks Carmel latte! A super cute & fun set my friend! !Love the fun sentiment and adorable stamped face..LOL! Too cute!Super fun card!! Awesome job my friend! These are absolutely adorable, Sherrie!! I love the colors and that fabulous burlap paper!! The face is too cute!! As always, the details you added...the embossing, the bows...everything is perfect!! Love them my friend!! I hope you are able to rest and relax this weekend!! I can't believe it's almost time for the guys' annual fishing trip...it doesn't seem like it's been a year!! I hope you do get to go home and be with your parents!! We've had lots of rain, too and last night - hail. Ish. The storms were bad so I had to shut off the computer. I already lost my DSLR camera this week...it won't turn on for some reason. I didn't want lightning to fry my computer, too. It happened to me once even with a surge protector. Anyhoo...happy Thursday my sweet friend!! So excited to see a post from you!! I miss them!! Big hugs!! Such a super CUTE set Sherrie! 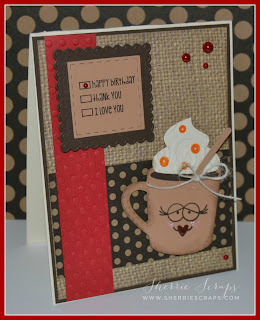 LOVE the burlap look and that face on the mug just has me giggling! Way CUTE! Your project is adorable! I totally love the color combination you used and the burlap paper looks amazing! All of the embossing looks amazing, so many fun details! Have a great day! Oh, I love the face on your mug....super cute! Thanks for playing along with us at Seize the Birthday! Hello! This is so SUPER cute, Im so glad you shared. I love these dies and I think I need them - haha! Have a great evening Sherrie! Such a fabulous set, Sherrie! 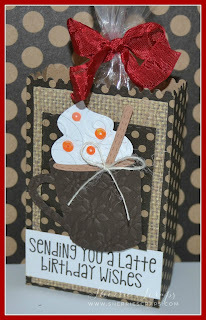 The burlap paper looks amazing and I just love the little coffee mug image!! So glad you found a bit of crafting time! Hope there will be more for you this weekend but am so happy that you can be busy with family! These are soooooooooo cute!!! LOVING the colors and the burlap!!!!!!!!!!!!! Super cute Sherrie!!! Thanks for playing along with our challenge at Jaded Blossom!! These are so cute! The burlap print paper is the perfect background for your coffee creations! Lovely coordinated set. Really love the embossed coffee cups. Great colors too. Thanks for joining us at Seize the Birthday. Oh, how CUTE! I love the sassy face on your coffee cup..those lips! I also love the way you used the burlap, it's just perfect for this card. Oh, those are really adorable!! The lips are so cute! LOL! I just love the texture of these SO much! Wonderful job on the set! Such a wonderful set, Sherrie!!! Super cute! Thank you for joining us for the May Challenge at Jaded Blossom. These are fabulous Sherrie! Love the fun PK face on the cup too! Thanks for playing along at Jaded Blossom! WOW! This set is gorgeous! I absolutely love that cute coffee mug and that adorable face! Love the colors and the textures my friend! Great gift! Cutest coffee creations ever. Love the burlap papers that CUTE face. Thanks a bunch for joining us at Seize the Birthday!! These are just too cute!! Love the sweet faces too and all your fun details!! Thanks for linking up your project this month!! This is so Yummy Sherrie. Love those colors and the design and the pretty embossing. I love it. such a cute coffee treat and card set !!! LOVE all the Jb u used to make it sooo cute !!! Thanks so much for linking up to our monthly challenge !! Awesome coffee set ~ too cute!! Thanks for joining us in the Jaded Blossom Challenge.